UDM Downloads > Miami Beach Screen Saver! MySOBE.com is a vacation guide and visitor information about Miami South Beach, Florida. Miami Beach is a very chic area and known throughtout the world by the abbreviation SoBe - South Beach - the area south of the city, is full of shops, niteclubs, refined restaurants and luxurious hotels from a certain age. It has many different districts, the southern area has a unique magic. The houses are painted in pastel colours typical of the strong immigrant cuban culture full of emotion, romance and exuberance. Always at the heart of fashion, music and trends, Miami Beach reinforces the ideas of fun, passion and being carefree. The main street Ocean Drive, where many Hollywood films were made - Fast 2 Furious, Reno 911, Transporter 2, Cocaine Cowboys, Scarface, CSI Miami, Nip/Tuck, The Birdcage, Blow, Bad Boys, True Lies , Miami Vice, Fair Game, and Italian film Natale a Miami (Christmas in Miami) - is the centre of SOBE at any hour. Bars, restaurants, niteclubs, music, etc. are all next to each other, giving a wide and different choice every day. 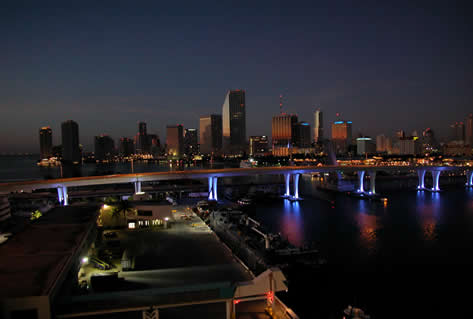 In MySOBE.com you can reserve, in full security, a hotel in Miami Beach and to encourage tourism, at reasonable rates. All of the hotels on Ocean Drive can boast a beautiful ocean view and are also only a few metres from one of the most famous beaches in the world.